(Lanka-e-News – 02.June.2018, 11.00PM) At the recent death commemoration of late most Ven. Sobitha Thera ,President Pallewatte Gamarala said , he does not know who prepared the 100 days program , and it was a foolish move. 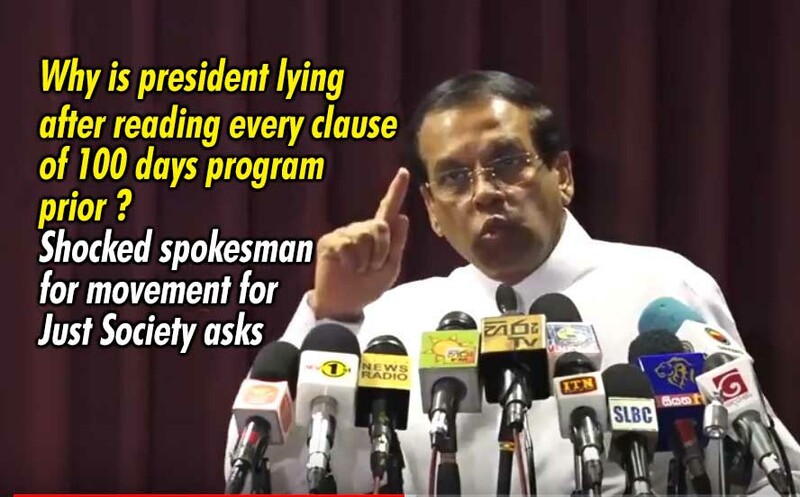 In this connection, a spokesman for the movement for just society speaking to Lanka e News questioned , then why on earth did this president Gamarala at that time at the Viharamaha Devi park read every clause after clause in that proposal and held discussions with the party leaders for hours before signing that to give approval ? These comments were made by the spokesman when we inquired from him about his views regarding the reckless , rudderless, senseless speech of Gamarala at the commemoration ceremony. Leading lawyers and politicians in order to form a movement for just society with a common aim to select a common candidate had discussions for two years with Lanka e News which contributed immensely to whip up a main opposition sentiment in this direction , together with every political party , every civil organization , and even organizations operating abroad . The members of the campaign for just society even travelled as far as to London , distance notwithstanding , on two occasions to hold final discussions with Lanka e News. At that time the draft of the 100 days program was prepared headed by most Ven. Sobitha Thera along along with a large group which included political parties , civil organizations , the intelligentsia , University lecturers and lawyers who were associated with this effort . It was therefore not the product of a single individual . That was finally compiled in writing after all the groups arrived at a consensus ,by Dr. Nirmal Ranjith. In Ranjith’s first compilation it was stipulated that the executive presidency shall be abolished within 180 days, but the UNP proposed that the period shall be 100 days since 180 days is too long. It was the proposal of the UNP after whatever are implemented of the 100 days program, the parliament shall be dissolved as early as possible. However nobody proposed that the parliament shall be dissolved on the night of the day following the common candidate becoming president . All the parties and organizations as well as Ven .Sobitha Thera then agreed that the executive presidency shall be abolished through the existing parliament . Subsequently , Gamaralalage Maithripala Yapa Sirisena left Mahinda’s government to field as a common candidate .The document that was prepared by Dr. Ranjith was distributed by Ven. Sobitha Thera among all political leaders after summoning them . The contents of the document were carefully read clause by clause and discussed on that occasion. All party leaders including Ranil , Chandrika and Sajith participated in this meeting. It was only Sajith who proposed that farmers and villagers of low income should be provided with basic relief, and that must be incorporated in the program . Gamarala however made no proposals ,and agreed in toto without raising any objection to any of the clauses. It was that document – the people’s agreement which was later signed by all the forces including the party leaders at Vihara Maha Devi park. That was how the 100 days program with election promises was launched during the presidential elections. In the circumstances , President Gamarala recently at the Foundation Institute most brazenly saying he does not know who founded the 100 days program , and that was a foolish move ,is most deplorable and despicable , let alone a gross betrayal , the Just society movement spokesman further pointed out. After holding discussions with the chiefs of the organization , an answer shall be furnished to the president , the spokesman said further. The full text of the speech made by president Gamarala at the commemoration ceremony of late most Ven. Sobitha Thera can be viewed hereunder.